Publisher Description : Someone is picking off fortune tellers and hippies in Oregon, snatching them out of their Birkenstocks mid-stride. And when the legend himself, Hal Rupert, Animal Control Officer, gets a whiff of the mystery, he knows he’s the man to solve it. 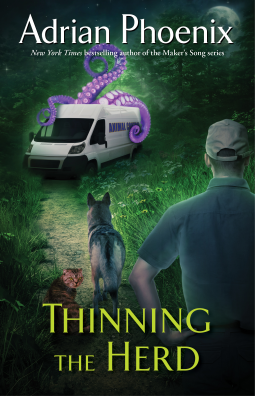 In between proudly wrangling out-of-control cats and dogs, he’s noticed a peculiar uptick in another sort of animal…werewolves. Review : That cover is hideous and should be burned before it injures somebody. Hal (the hero) read like Ash Williams in Army of Darkness where he has a grandiose idea of who he his and backs it up. With his cat and wolf shifting friends and his would be love, Goth Girl, Desmedona they take on a supernatural threat to the people of Eugene/Springfield. I had a good time reading this. The characters were well built and developed well with the story line. Definitely not to be taken seriously as it is fairly glib and at times has very pointed humor. Note to author: A handguns trigger is not cocked, the hammer is. 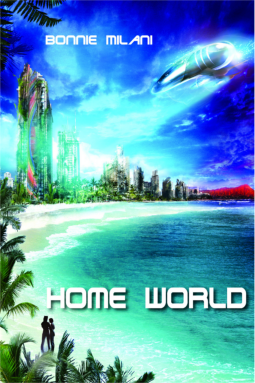 Publisher Description: Centuries of ruinous war have left Earth little more than a dusty tourist world within the star-flung Commonwealth she founded. 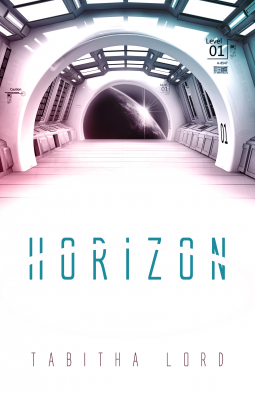 Now, amid the ruins of a post-apocalyptic Hawaii, Jezekiah Van Buren has found a way to restore Earth – Home World to the other worlds of the Commonwealth – to her lost glory. Review: This was a long novel, which is a good thing in our serialized culture. Jezekiah is next in line for the protectorship of Earth and machinates an alliance with a race of powerful lycans. He only has to get his crazy, murderous sister to marry the head Lycan in order to seal the deal. The character development is good as the novel is long, so there is plenty of movement to accommodate even the bit players. Letticia is a wonderfully funny, crazy and scarey character whom is constantly seeking to kill Jezekiah in order to be next in line. Some of the characters didn’t ring true, or fell a little flat due to an exorbitant amount of focus, for little return. For instance, Mote, aka Keiko Yakamoto is super speshul. Grandfather Ho seeks to use her, Jezekiah and the Lycan want to bang her, the Security chief has a daddy complex for her, General Yakamoto lends her grief and Letticia wants to kill her. The world building is pretty good, considering that the story line is set entirely on Earth. There is no alien planet starhopping or bizarre aliens to contend with, just genetically enhanced humans made for diverse environments. A very good read that could have used a dose of adventure to limit the emotive interactions. Publisher Description: When Virgil is betrayed and murdered, he thinks his days of catching fugitives as a U.S. Marshal are over. He is condemned to an eternity of filing paperwork in the First Circle of Hell. Then a demon lord gives Virgil an unprecedented assignment. He will return to Earth as part of a team: two souls from Heaven and two from Hell. Review: Not much to say about this novel. It was a fun and engaging read. The characters are well developed and grow within the story line. The world building is first rate and captures the imagination. 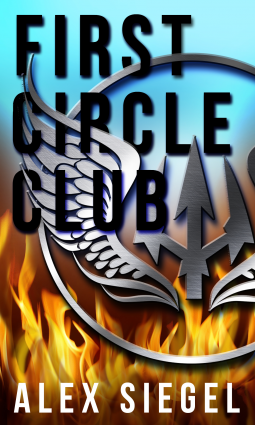 Publisher Description: Caeli Crys isn’t living—she’s surviving. On the run after the genocide of her empathic people, she witnesses a spaceship crash near her hidden camp. When she feels the injured pilot suffering from miles away, she can’t help but risk discovery to save his life. Review: Caeli Crys is….you guessed it, Speshul. She’s always blushing or being demur, quiet, thoughtful, brilliant, beautiful, strong and giving. Not to say people cant have those qualities but there is never anything wrong with Caeli. She can heal with her mind and empathically read others minds as well (so she can speak alien languages in a few seconds). Her only downside is the rage she feels for others subjugating her people. Wah? So as per the recent pattern of romantic novels that try to be SciFi or thriller or fantasy, we get hunky space man Derek, whom she saves with her MIND and soon they are on his spaceship banging each other amongst the stars. Caeli is so great that she endears herself to suspecting crew members and saves everyone with her MIND. The characters are not deeply developed enough with the movement so their antics are rendered flat. The scene progression is all about Caeli with some infusion of new characters that are also uninteresting. The world building is finite, meaning some names of other aliens(?) are thrown out there but they are human?? “Actually” was used 30x which is not the most that I have encountered but is getting up there. The ending is a kind of cliffhanger or in this case, unresolved spew that hints at a series of MIND numbing journeys featuring Caeli the speshul and her douchebag boyfriend, Derek the Dumb. 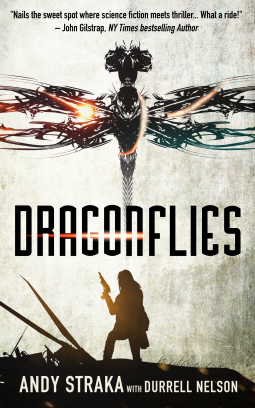 Publisher Description: Former Army helicopter pilot Raina Sanchez, grounded after being shot down and desperate to be back in the air, plunges into a brave new world of stealth-killing micro-drones. Review: Raina used to fly helicopters and you will be reminded of this, constantly. Between the flashbacks and the pining of her lost foot you will be bludgeoned with her almost otherworldly abilities. She has a hunky SF dude that saved her life in Afghanistan that she has the hots for, and they both just happen to be working for the same shadow organization. There were some plot holes that were not adequately explained. For instance, Raina gets kidnapped for the second time and they whisk her away. Meanwhile, Tye (lol) is watching this all go down, and suddenly is able to track her to a mobile unit in which she is trying out new tech in order to pass the kill test. Later, the authors try to make sense of this passage in an interlude and fail to resolve anything. So Tye steals a truck where she is being kept (why would he need one if he followed her in something??) and a laughable shootout ensues where Tye shoots people through the neck while driving one handed with a fugging Beretta pistol. Then we have Major Williamson that always finishes his sentences with “That is on a need to know basis”, or “I have my sources/connections”. Why would Tye and Raina continue to work for someone that wont tell them anything while they are being shot at and abducted? Got me. Well, never fear, Williamson kind of tells them more about the situation they face, and like good little robots they follow him blindly. See, the bad people kidnapped Raina’s brother who hates the military but somehow knows that there are micro drones out there assassinating people. But despite their differences, Raina loves him, well, like a brother. Fug. Really? I get that Williamson is Cloak and Daggery and he provides the story line with a slow reveal. Excessive and not too believable? Probably. I get that Tye and Raina are hooked up together in this, but the blind allegiance is laughable. The tech is there (MAV’s) but is never fully described or explained. You just have to accept that the tech is viable. The flashbacks that Raina and Tye have are unnecessary and hinder the flow of the story line. Most of the characters don’t fully develop as expected with the movement, so you don’t come to give a shjt about them. The only thing that develops is Tye’s erection and Raina’s tingling naughty bits. This lost a star due to the spelling and grammatical errors that plague the novel throughout. Read this at your Grandmas and her 38 cats. 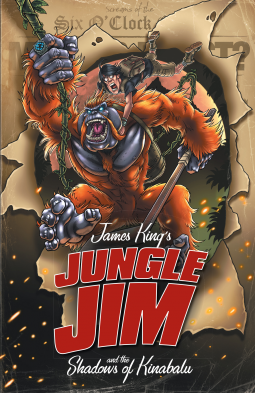 Publisher Description: ‘Jungle’ Jim swings into action in his first exciting adventure, as the superpowered simian tries to shed some light on the mysterious Shadows of Kinabalu. Review: Pretty fun romp through fantasy land built for the YA crowd. It kept me reading which may reflect on my shallow perceptions. A lot of light hearted fun to be had. Publisher Description: Eleanor de Lacy has been bartered: her hand in marriage in exchange for a truce with her father’s sworn enemy. 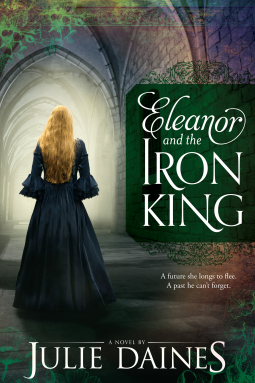 Now the headstrong beauty must leave her ancestral home and the man she secretly loves to become the wife of the infamous Welsh King Brach Goch. Review: Eleanor jumps to conclusions based on scant evidence throughout the novel. She blames Brach for killing her brother and raiding her homeland yet can’t resolve her feelings for the King. He’s nice to her and reasonable whereas her father deals in cruelty. So yeah, Eleanor is dumb about most things yet it is this seesawing of emotion coupled with blind insight that gives the novel its depth. The movement is really well done and builds the characters in spectacular fashion. Most of the time you are cheering for Eleanor to get a clue and the slow reveal of the Welsh King’s personality is almost maddening. Owain, Anise and Gil are great supporting characters that lend dumbass a hand at pivotal points in the storyline. I really expected this novel to expand as the world building potential is high. Sadly, this was not intended to be an epic adventure but rather about a woman’s gradual enlightenment. Still, good writing and story telling to be had.